I’m no expert on the use of charitable contributions to buy prestige, but this case out of UO sure has some interesting twists, and might even displace the Avery Fisher Hall naming rights buy-back and the Central Park Zoo story on my syllabus. 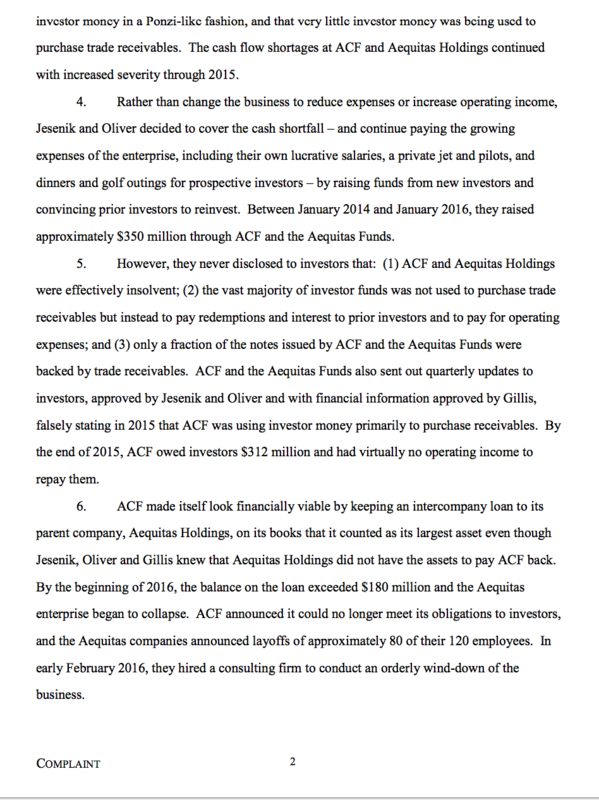 The Securities and Exchange Commission alleges that UO accounting alumnus and donor Bob Jesenik raised $350M from investors in his Aequitas firm, promising them high returns from buying up and aggressively collecting on the student-loan debts that students at the Corinthian for-profit business and technical colleges had taken out to pay their tuition. 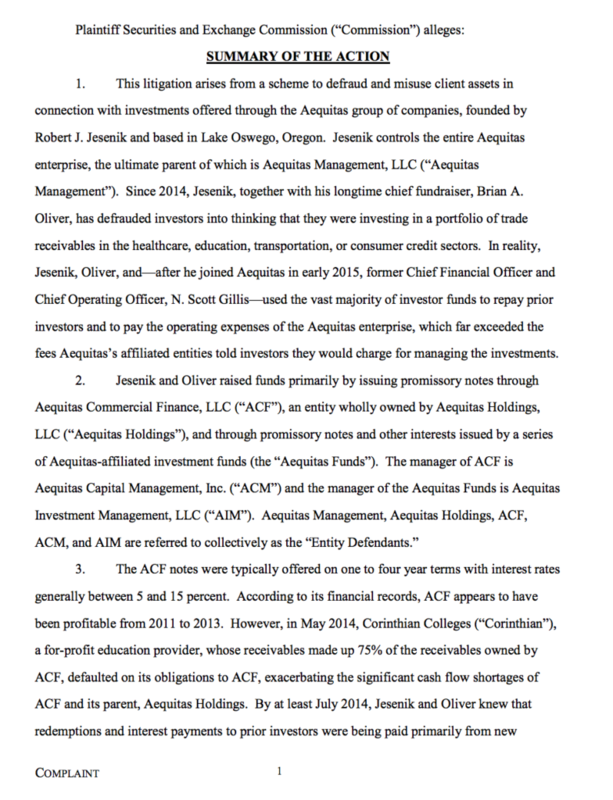 While this was going on Aequitas was pledging to give scholarships to UO finance students – with plenty of publicity from UO – and Jesenik was using the prestige to get stories in the business trade press that helped make his company look profitable and encouraged new investors. As part of Aequitas Capital Management’s effort to look solvent — even wealthy — in the eyes of investors, the company earlier this year announced it would give scholarships to students of finance at the University of Oregon and Oregon State University. The image-polishing tactic by the high-flying Lake Oswego finance firm went along with opening a swank new office on Park Avenue in Manhattan, the use of a private jet, and “posh dinner and golf outings,” the U.S. Securities and Exchange Commission said. … It’s unclear exactly what the Aequitas collapse means to the universities. The UO faced a similar situation in the late 1990s with Capital Consultants, a Portland investment firm owned by class of ’64 alumnus Jeffrey Grayson. Grayson, like Jesenik, had prospered financially and also volunteered for his alma mater. He served as president of the UO Foundation in the mid-1990s. He became co-chairman of UO President Dave Frohnmayer’s “Campaign for ­Oregon,” a then-record-setting UO fundraising drive. In 1997, Grayson pledged $1.5 million toward a remodel of the UO’s old law school building. The UO was so pleased that it sought special dispensation from the state to name the building after a living donor, and upon completion, it became Grayson Hall. But Grayson had provided only $850,000 by the time his investment firm — known for its risky, unorthodox deals — collapsed amid an SEC investigation and accusations that he was hiding losses from his investors. … Because of the donor secrecy provisions in the state law — requested by Frohnmayer and adopted by the Legislature — there’s no public account of how much Aequitas or its principals gave to UO or to OSU.